Six months ago Liberty Collins was advancing in her career at a prosperous marketing firm and dreaming of a bright future. Now the only thing darker than her nightmares is reality. 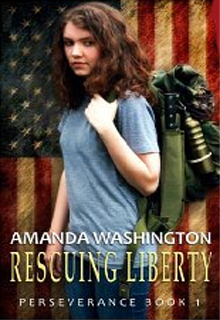 In a socially, and economically, collapsed America, Liberty struggles to find the courage to endure, and the strength to protect herself. Her faith, constitution, and sanity are challenged as the lines that separate right from wrong grow increasingly blurry. Connor Dunstan was a thriving personal injury attorney with a comfortable life and a deeply-buried past. As the country crumbles and provisions dissipate, the survival of Connor and his unforgiving niece, Ashley, rests on his ability to trust someone other than himself. Formed for the sake of a child, this precarious alliance struggles to find light in a dark world, and hope where none exists. If they fail more than their freedom will be lost.